Educational Qualification: Candidates should have passed UG Degree from a recognized board/university. Age Limit (as on 28-02-2019): Minimum 21 years & Maximum 28 years(Check official notification below for age relaxation). Selection Process: Online Psychometric tests and personal interview. 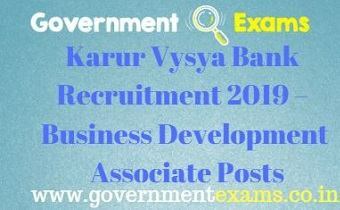 Click here to view official notification: Karur Vysya Bank Recruitment 2019 official notification. Click here for online registration: Karur Vysya Bank Recruitment 2019 online registration.